Why have the great revolutionary leaders of modern times�from Robespierre to Lenin and Mao Tse-tung�so often been ascetics, austere "puritans" with few emotional ties? 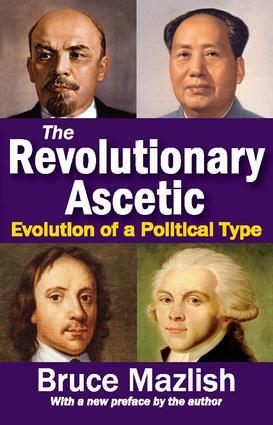 What functions, political as well as personal, do these ascetic traits perform for the modern revolutionary leader and for his followers?Noted historian and author Bruce Mazlish is convinced that, beginning in the nineteenth century, the needs of modernizing revolutions have produced a distinct new type of political leader, the revolutionary ascetic. This individual's denial of personal pleasures and commitments both enables him to perform politically necessary, if personally repulsive, revolutionary acts, and to command the allegiance of his more worldly followers.Starting with Cromwell and the religious ascetics of the Puritan Revolution, Mazlish shows, in a series of fascinating personality sketches, how this asceticism first became secularized with the French Revolution and then in the nineteenth and twentieth centuries was put to the service of a new kind of "total" modernizing revolution in Russia, China, and elsewhere. In two remarkably vivid portraits of Lenin and Mao Tse-tung, Mazlish shows us precisely how two of the century's best-known revolutionaries consciously and unconsciously used their personal asceticism to induce revolutionary change.